Have you ever taken inventory of all the skills and talents you possess? Are you leveraging them to the degree you could be? We as musicians aren’t just creatives anymore. We aren’t just business people either. We’re creative alchemists. In this episode of The New Music Industry Podcast, you’ll learn what it means to be a creative alchemist. 02:39 – What is creative alchemy? Thanks for joining me. Today, I wanted to talk about the rise of creative alchemy. I’ve been an advocate and a supporter for the concept of music entrepreneurship for a long time now. But I’m beginning to see some flaws in what that means for people. The main issue is how much time and effort we focus on self. We think about how much we know, how much work we’ve put in, the knowledge that we’re gaining, how many books we’ve read, how many podcasts we’ve listened to, what skills we have, what people we know. It’s all about self, self, self. We forget that there are so many other pieces that make this whole thing work. It’s not just about us, it’s about the fans. And it’s also about the team that you build around you. Without that, you can’t call it entrepreneurship, it’s just solopreneurship. I’ve talked to many entrepreneurs and some of them even say solopreneurship is not a real thing. That doesn’t even exist. I think a better place to put our attention would be on building teams and collaboration and working with others in coming up with ideas together because that’s really where some of the best ideas come from – brainstorming with others and masterminding with others. Recently, I’ve been talking more and more about why the artistic cycle is flawed. As it really doesn’t serve the fan, essentially what it is: First, we start writing our album. Then we record and publish our album. Then we promote and go on tour. Then we stop possibly even for several years before we start all over again. But today, your fans really can’t wait that long, especially your most loyal fans. They want to see more from you. They want to be able to purchase more. I’ve even talked about the fact that they are willing to spend more money with you if you just give them the opportunity. There are some really interesting ideas out there about music entrepreneurship. Some people seem to be promoting this idea of anti-establishment. In other words, forget the labels, forget the marketing companies, forget whoever else might be willing or able to help you. Let’s just go out and do this on our own. Don’t get me wrong, I also believe the best way to build your career is often to manage it and oversee it yourself rather than relying on somebody else to make it happen. But I also haven’t been too quick to say let’s tear down the establishment. Why? Because that establishment could be leveraged. Essentially what you’re doing, if you’re becoming a music entrepreneur is creating your own establishment. So, it doesn’t make any sense to be anti-establishment. Those two concepts are completely in conflict with each other. What I believe we should do is connect with establishments just like our own and partner up with them and leverage those connections to further our careers. We shouldn’t be working with anybody who’s going to be dishonest or disloyal, but at the same time, we should be thinking about the resources we can tap into and what resources other establishments already have. What is creative alchemy? I would simply define it as the art of combining your skills and talents to create something unique. In that regard, it’s not that different from music entrepreneurship but it might be a term that you can latch on to more easily because it simply denotes this idea that we are creators and we can create different things and we have different skills and abilities. Combining those skills and capabilities can help us create something very interesting and unique in the world. I’ve already talked about the fact that the artistic cycle doesn’t really serve the fan. I think it’s important to be thinking like a content creator instead of just as a musician. There are people just like me publishing something new to their blogs on a weekly or even daily basis just to let people know what’s up and what’s new. That’s the approach creative alchemist should be taking. I think it’s very easy to create a need for knowledge or need for information. Certainly, with music entrepreneurship you should be learning more about business and how business works and applying that to your music. But I think there are a lot of practices out there that even though they work, they may not be the most honest and most sustainable ways of doing business. If you’re a musician and you’ve been creating music for a while, then the reality is there are already many people that like you. So, to me it’s not about creating some kind of funnel. It’s about demonstrating your passion. Why you do what you do. 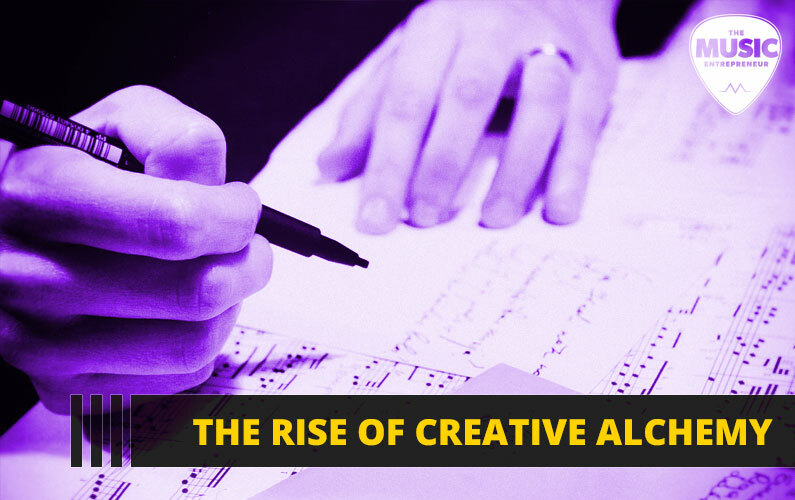 With millions and possibly even billions of people now creating music in this world, it isn’t just about business knowledge. It’s about sharing your why. Why do you do what you do. If people connect with your story, then they will buy from you. I’ve talked about Austin Kleon before. He has a book called Show Your Work! He talked about this concept of the daily deployment. What a fantastic idea. Why not share something new with your fans every single day? Why not write a blog post talking about what it is you’ve been up to? If you can’t do it daily then do it weekly or at the very least monthly. That will keep people updated as to what you are doing. It’s really just a different way of thinking about this whole concept of blogging or podcasting or creative videos, but it’s a great way to be in touch with people and to build more fans and more traffic over time. Additionally, to me relationships are crucial. They are very important but it’s not about bugging people which is what we’re doing right now. We’re reaching out to influencers and say “Hey, share my stuff, okay? Otherwise, I’m going to be broke.” That’s not what you want to do. What we want to do is create connections, because we tend to overestimate how well influencer marketing is going to work. In many cases, it may not do that much for you. It’s not just about learning and developing your own skills even though I invest a considerable amount of my time into that because I prioritize it. Again, that creates that very narrow track where it’s all about self. It’s all about the personality. It’s all about the brand and the person representing that brand. So, it’s not just about your own skills. It’s about working with people that has skills that you don’t have. I was just at WordCamp this past weekend. What a fantastic experience. There are plenty of people there that know more about SEO or marketing or web development or coding a website or even selling books than I do, but those are relationships and contacts I can tap into. I can ask questions and find out what they did, what worked for them, and then leverage that knowledge and apply to my career. We can have funnels in the perfect website and all these things set up, but if it contributes nothing to creating a unique experience for your fans, then it’s worthless. It’s about offering more value and giving them a reason to follow, or subscribe, or become a member of your website. It’s about that sense of belonging and community that so many people are starved for these days. So again, we can learn a lot on our own but I just want you to recognize knowledge isn’t power because the decent plan acted on is always better than the perfect plan not executed at all. I would suggest getting out of your head and sharing your heart instead and get behind this concept of creative alchemy, which isn’t just about business knowledge and head knowledge and what you know. It’s about heart connection and creating experiences for the people that are following you. Thanks for listening. What are your thoughts? What did you get from this episode? Please leave a comment in the show notes and let me know.